Last year, the Moorestown High School field hockey team went 14–5–1 overall, 7–1 in conference play, and won their fourth sectional championship in five seasons. This year, the Quakers hope to improve their record and success with help from key returning players Avery Powell, Delaney Lawler and Roxy Vassighi. “We have a very young and experienced team — kind of an odd combination. We hope to challenge again for a Group III state championship, but we play a really tough schedule, so we’ll have to practice everyday like we’re heading into the playoffs,” Ali Collins, varsity field hockey coach, said. Last year, Powell had 17 goals and eight assists; Lawler had eight goals and eight assists; and Vassighi had nine goals and five assists, helping the Quakers tie with Rancocas Valley for first place in the Burlington County Scholastic League Liberty division. However, their season ended with a loss in the Group III state semifinals against Ocean City. “I’m really excited for the season to start because we have most of the girls back and everyone has been improving over the summer. This year, the atmosphere is so much more exciting with everyone’s dedication and focus,” Powell said. After having graduated midfielder Susan Orth, who tied Powell with most goals for the season at 17, the team is now looking to its fairly large senior class that includes a lot of experience on defense to maintain its consistent strength and skill. “We have a tremendous defense coming back this year led by Nicki Dadino and Kaitlyn Valentino. We also have some sophomores that will be playing defense that will be really great because they were starters last year as freshman so they have experience too and great talent,” Collins said. The team also has three sophomore goaltenders, Logan Donahue, Katie Stefano and Lauren Pickul, battling for the starting spot. Collins hopes that through their individual drive to obtain the starting position, each goalie will help push the entire team to have the strongest defensive backfield possible. 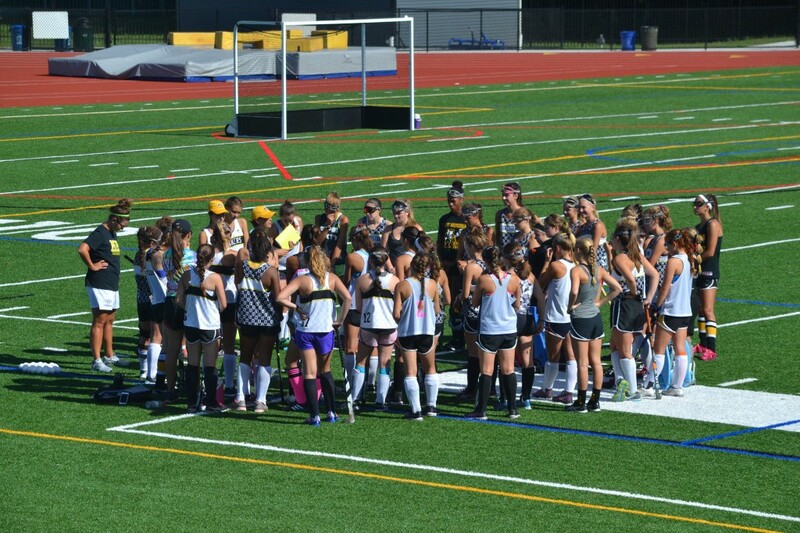 Moorestown High School field hockey has won the state championship 16 times, and this year has its sights set on shooting for the team’s 17th.